A quiet transformation is occurring in the electric power industry, with many people unaware of the facts and the implications. My recent interactions over the internet show that some, perhaps many people still believe that the US has hundreds of years of coal supplies, and worldwide there are 10,000 years of supplies. However, the facts as shown below are clear: at present price of $9 per ton for Powder River Basin coal, only 10 billion tons are economically recoverable. The market report for coal prices from EIA for August 5, 2016 shows Powder River Basin coal at $8.70 per ton. The chart below is from Figure 123 of the USGS Professional Paper 1809, 2015 by Luppens et. al. source: Luppens, J.A., Scott, D.C., Haacke, J.E, Osmonson, L.M., and Pierce, P.E., 2015, Coal geology and assessment of coal resources and reserves in the Powder River Basin, Wyoming and Montana: U.S. Geological Survey Professional Paper 1809, 218 p., http://dx.doi.org/10.3133/pp1809. Far lesser amounts exist in the Appalachian and Illinois basins. With US coal consumption at approximately 700 - 800 million tons annually, there are less than 20 years of coal remaining. A bit of perspective on this follows. Coal reserves is not the same as total coal in the ground. Reserves refers to the quantity that can be brought to market using best available technology and at present prices. An analogy can be made to relieving the chronic drought in the western United States. It is well-known that enormous amounts of fresh water exists in the glaciers of Alaska, only a few thousand miles away. The frozen water in those glaciers can be considered a water resource. It exists, we know where it is, and we know approximately how much water there is. However, capturing an iceberg that calves off a glacier and into the ocean, then transporting that iceberg to Los Angeles, melting the ice into water, purifying the water to health standards, then delivering the water costs enormous amounts of money. In effect, none of the Alaskan glacier water is recoverable at present prices and with present technology. Therefore, the water reserves from Alaska is zero. Another example is from gold mines. Many gold mines exist, but only those that can yield a profit at the present price of gold.are actively mined. The same is true for almost any mineral resource, including oil and natural gas. Many oil and gas deposits are known to exist but are left idle because the cost to extract and move the product to market is simply too great to yield a profit at present prices. Coal mining is no different. 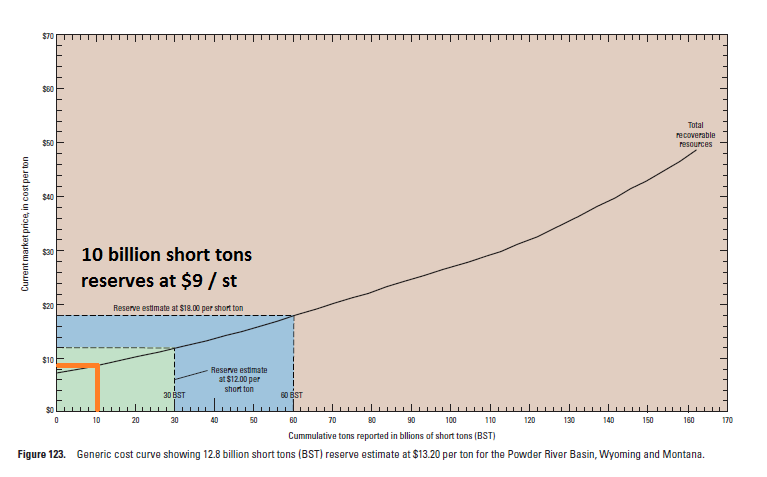 As the chart above shows, approximately 160 billion tons of coal exist in the Powder River Basin, but the price required to recover that coal is $50 per ton. That is approximately 6 times the present price.